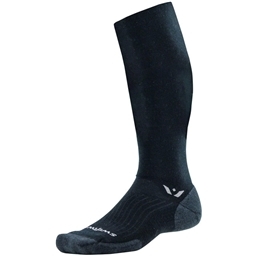 A moderate compression, merino wool sock that sits above the knee. Compressive and super-comfortable - I always want to leave them on after riding. Legs feel as though they are being coddled. Great in a range of temperatures. Never itchy. Fast-drying and virtually odor free. Feels too sad to take them off. Feels too indulgent (or old-man-ish) to leave them on all the time. Too bad they are not available in a wider range of colors!